ALPHARETTA, Ga., Aug. 3, 2016 /PRNewswire/ — EndoChoice Holdings, Inc. (NYSE: GI) announced the recent FDA clearance and US launch of Lumos™ with Adaptive Matrix Imaging. This novel and proprietary imaging software system will now be part of the Company’s Generation 3 Fuse® Full Spectrum Endoscopy® System. EndoChoice scientists and engineers worked together to develop Lumos based upon Adaptive Matrix Imaging which analyzes and selectively enhances the vascularity, surface texture, and color of abnormal tissue, providing detailed information for physicians to assist in their detection of abnormalities during GI procedures. 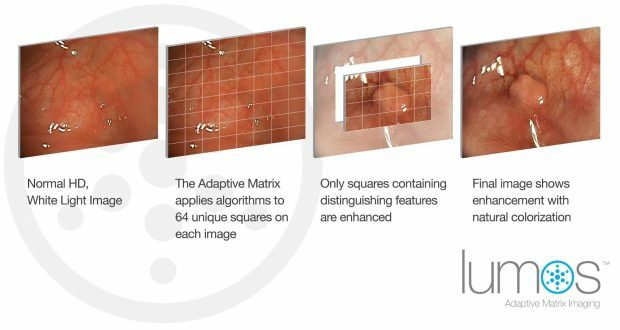 Lumos facilitates seamless physician detection and inspection of affected tissue by toggling between two settings. The first setting is designed to selectively enhance tissue and may remain on throughout the procedure, while the second setting allows for a more in-depth inspection once suspect tissue has been identified. Lumos was launched in key international markets in February of this year and physicians have already started seeing the benefit that Lumos can provide. “Other image processing technologies alter the image, which can be distracting. With Lumos, only anatomy that has certain textures, vascularity or abnormal anatomy is enhanced, allowing me to keep my focus on potentially diseased tissue” said Peter Siersema, MD PhD, Professor of Endoscopic Gastrointestinal Oncology at Radboud University Medical Center, Nijmegen, The Netherlands. In a recent unpublished clinical study, physicians found that Lumos with Adaptive Matrix Imaging enhanced lesions with pit patterns and was useful as an aid in the detection of tissue abnormalities throughout the entire procedure. EndoChoice has multiple patents pending on this new technology. Based near Atlanta, Georgia, EndoChoice (NYSE: GI) is a medtech company focused on the manufacturing and commercialization of platform technologies including endoscopic imaging systems, devices and infection control products and pathology services for specialists treating a wide range of gastrointestinal conditions, including colon cancer. EndoChoice leverages its direct sales organization to serve more than 2,500 customers in the United States and works with distribution partners in 30 countries. The Company was founded in 2008 and has rapidly developed a broad and innovative product portfolio, which includes the Full Spectrum Endoscopy System (Fuse®). EndoChoice, Fuse, and Full Spectrum Endoscopy are registered trademarks of EndoChoice Holdings, Inc. This press release contains “forward-looking statements” as defined under U.S. federal securities laws, including, among other things, statements about our products, operations and financial performance. Examples of forward-looking statements include, but are not limited to, the anticipated market acceptance and adoption of Lumos. Forward-looking statements include all statements that are not historical facts. Forward-looking statements involve known and unknown risks, uncertainties, and other factors that may cause our actual results, performance, or achievements to be materially different from any future results, performance, or achievements expressed or implied by the forward-looking statements. Given these uncertainties, you should not place undue reliance on any forward-looking statements in this press release. These statements are not guarantees of future performance and are subject to future events, risks and uncertainties – many of which are beyond our control or are currently unknown to us – as well as potentially inaccurate assumptions that could cause actual results to differ materially from our expectations and projections. Except as required by law, we disclaim any obligation to update any forward-looking statements for any reason after the date of this press release.